Choose advertising that will work just as hard and smart as you do. Let Watchfire help you transform your signage — and your bottom line. You already know that driving traffic from the pump to the store is a proven way to increase profits. Join the growing list of convenience store and retail petroleum industry leaders who are using Watchfire LED signs and Price Watcher™ gas price displays to gain new business. 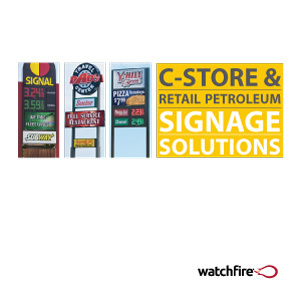 Learn more about signage solutions for convenience store and petroleum retail locations in this free product guide.